Openlibrary.org has over 3M books lining its digital shelves, but nothing quite beats being able to embed your favorite book directly on your personal site. Last week, with the help of volunteer Galen Mancino, we launched an embed tool which lets you add any Open Library book to your website or blog. Next time you write a book review, you can place its Open Library book right next to it and, if its available, enable your audience to read it with a single click. 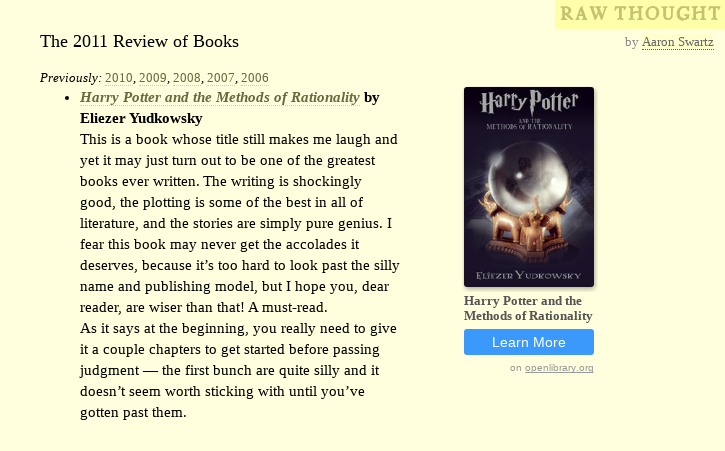 Here’s a version of a webpage which has been modified from its original form to include an Open Library book embed side-by-side its book review. Want to add a book to your site? Here’s how! 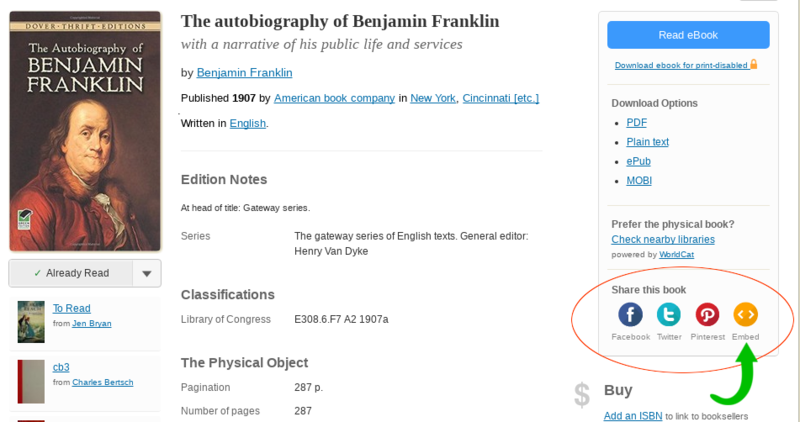 First, find your favorite book on openlibrary.org and click on the embed button (see figure 1). A message box will pop up containing a line of html code you can add to your to your website (see figure 2). In the future, we’re considering extending the book embed feature to support reading lists. If you’re interested in this feature, please let us know on our twitter or github. Galen Mancino is a volunteer for the Open Library project. He is passionate about sustainable and local economic growth, revitalization, and how technology can bring us there. He is currently pursuing his Master’s in Interdisciplinary Computer Science. You can learn more about what Galen is working on by going to galenmancino.com. That’s one cool feature. I have often blogged about the books that I borrowed from Open library. Earlier I used to provide a general link to the book, now I can do this. Thanks a lot.